Maybe you’ve heard about LiFi and its revolutionary speeds up to 1000 times faster than WiFi, the current wireless Internet technology standard, but what is LiFi exactly? How can we use it? Will LiFi replace WiFi? LiFi.co is here to help you understand how LiFi is likely to transform our digital world. LiFi can be up to 1000 times faster than WiFi. This high speed and extremely stable internet is necessary for our transforming world. Shared and often overloaded broadband networks have a lot of security issues. LiFi allows us to shut the door on our wireless data. LiFi technology is cost-effective, low-maintenance and can be integrated into exisiting LED lighting infrastructure. Unbeknownst to us, the air around us is filled with large blocks of data. Phone masts, radio towers, remote controls, taxi radios, airport beacons, and many more pour forth data on a daily basis. Through all of these data, we have become so interconnected that we can’t imagine life without it. But as the demand for big data continues to increase, everything could one day grind to a halt. This is known as the spectrum crunch. There have been talks of a looming spectrum crunch since the early 2000s. The main reason for this is the overwhelming demand for radio frequencies over which data can be transmitted. However, the radio spectrum is a finite resource. As such, it can only allow so few broadcasts before it runs out of available frequencies. And as the demand gets heavier, the day it arrives also comes sooner. To solve this problem, newer technologies are necessary to provide spectrum relief. This is where LiFi comes in. LiFi is a wireless optical networking technology. Specifically, it is a form of visible light communications (VLC) system that makes use of light-emitting diodes (LED) for data transmission. LiFi has a special distinction from other VLC systems. Similar to WiFi, LiFi is the only form of VLC that allows the bidirectional transmission of light. However, instead of the radio spectrum, it makes use of the visible light spectrum through LED lightbulbs outfitted with a special chip. What is so good about LiFi? In so many ways, LiFi is considered more superior to WiFi. Data transmission tests have reached speeds of up to 224 Gbps, roughly 100 times faster than WiFi. While these were only lab tests, speeds at even a small percentage of that figure in the real world still indicate having a significant advantage over WiFi. The visible light spectrum is also broader as opposed to RF – about 10,000 larger than the entire radio frequency spectrum. This is crucial especially with the data demands of today. It provides many available frequencies to which tasks can be offloaded, freeing up much-needed space for 5G. LiFi uses visible light as a medium for the transmission of data. As a type of VLC system, it requires two components: a photodiode and a light source. The photodiode acts as a transceiver that receives light signals and transmits them back. The light source transmits data using emitted light as the medium. In this case, light emitting diodes (LED) serve as the light source. They are outfitted with a chip that serves as the signal processing unit. LED light bulbs are semiconductors. This means current supplied to the bulb can be modulated, which in turn, modulates the light they emit. This process occurs at extremely high speeds that are unperceivable to the human eye. Data is fed into the light bulb and sends the data at extremely high speeds to the photodiode. It converts the data received into a binary data stream perceivable by humans such as video and audio applications. To send data over light, LiFi systems require a strong, robust light source like LED bulbs. LEDs are different from halogen or filament bulbs as they do not need to warm up. As previously stated, they are semiconductors. They start up quickly and emit light according to the current passed through them. Within the light, the intensity of the colors red, green, and blue (RGB) is finely modulated to embed data into the LED light. (Again, this process is undetectable to the naked eye.) This fine modulation of RGB can be better described as a form of code. Once the light is received by a photodiode, the light is demodulated. The information received is either relayed to a cloud server or transcribed by the receiver itself. Content is then displayed according to the code obtained. Back in 2016, announcements were made about an extension of standard WiFi called WiFi HaLow. The project claims to double WiFi’s range of connectivity while also using less power. 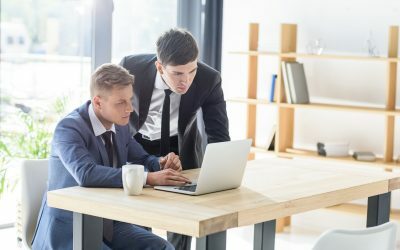 Because of the announcement, many anticipate its applications for greater mobile connectivity and the Internet of Things (IoT). However, with the impressive speeds of LiFi, it is poised to make an even bigger impact than WiFi. Here are several advantages LiFi can offer over WiFi. Speed: Perhaps the biggest selling point of LiFi technology is that it is able to transmit data at far greater speeds than WiFi. During lab tests, researchers were able to reach bidirectional transfer speeds of 224 gigabits per second. Of course, it would be difficult to reach those speeds in a real-world setting. But reaching even 1% of that means speeds of 2.24 gigabits per second – a significant improvement over WiFi, which nets transfer speeds of about 20 megabits per second. Versatility: With the current operational concepts of LiFi, its experimental applications center on the use of LED bulbs and lamps. Hence, it is easily integrated into areas that already use LED lighting systems. The internet is readily-accessible wherever there is light and can be used in a variety of applications that require an internet connection. 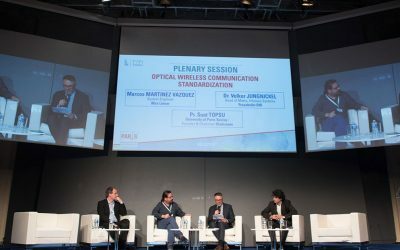 Cost: Because LED lamps are inexpensive to produce, analysts predict that the deployment of LiFi would be easier and ten times cheaper than WiFi. Plus, they are more energy-efficient than any other lighting technology. As LiFi systems operate to provide illumination and for internet connectivity, you save up on energy costs. Availability: As the world looks to use green technology, LED light bulbs are becoming a staple everywhere – in homes, offices, businesses, and even transportation. This means soon enough, high-speed internet connectivity will be as ubiquitous as there are light bulbs. Security: RF communication technology has always been vulnerable to eavesdropping, signal hijacking, or even brute force attacks. However, visible light is unable to permeate opaque surfaces. Signals emitted by LiFi as well as the data transmitted through it remain confined within the space. Limitations: LiFi offers a limited range. While this may prove useful for security, it also creates disadvantages. Physical barriers limit its operational scope. In order to increase its scope, lamps or bulbs must be strategically placed in various rooms. In contrast, a single WiFi router has a wider, longer range, making them an ideal selection for public networks. Interference: LiFi signals are susceptible to light interferences, including sunlight. Receivers may have a difficult time to process signals when other sources of light are present. Moreover, because LED lamps must remain on to function, they can further contribute to light pollution, especially if set at higher brightness levels to compensate for possible interference. Infrastructure: Theoretically speaking, deploying LiFi systems are inexpensive because they only make use of LED lamps. In reality, the installation of LiFi systems can become expensive due to the lack of infrastructure. 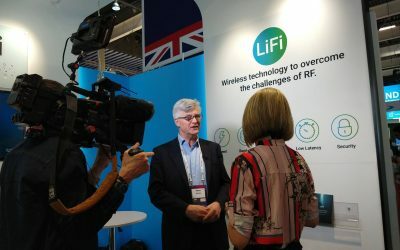 Additionally, due to its limited range, several LiFi routers will need to be installed for greater connectivity. This means incurring additional purchase and installation costs. In contrast, a small home will only require a single WiFi router. Sign up for our FREE newsletter and get updates about this revolutionary technology.